Learning a new language is a great way to have a brand new skill and trait that can carry you through to the rest of your life. It’s something that you can add onto your resume when applying for jobs and you can even use it as a trait and skill when applying for schools, colleges and trade school courses. No matter how you make use of a new language, it’s always something to strive to become fluent in. One of the most sought-after languages out there is Swedish. Millions of people learn Swedish and speak it on a routine basis, so this is a language that is going to get you far in life. You might be wondering why to learn Swedish and how it is going to benefit your life. The why learn Swedish reasons are incredibly diverse and truly reflect on how you plan on using the language once you become fluent. You might be trying to speak Swedish because you want to easily and quickly communicate with a loved one or someone who you have become close to. You might also be trying to learn Swedish because you would like to be able to function more appropriately at work. You may also be looking to travel abroad and need to know Swedish in order to communicate with the world around you. 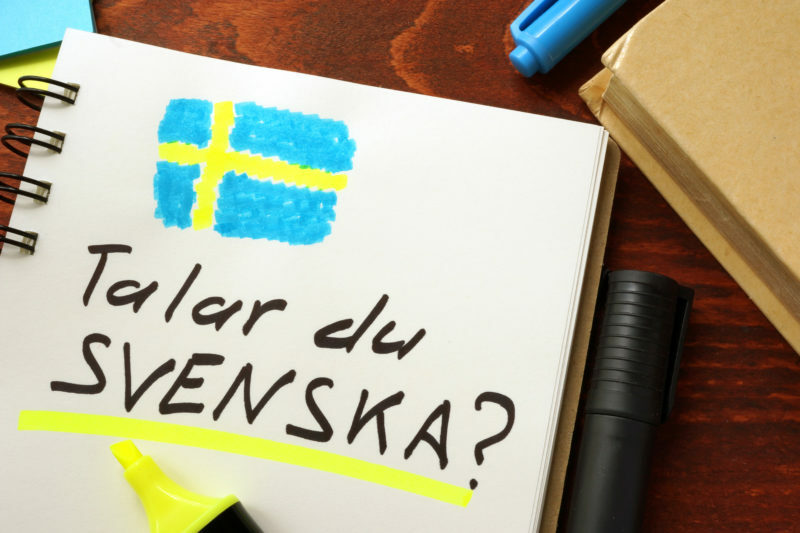 No matter why you want to learn the language, it is important that you start so that you can develop the skills to become truly fluent in Swedish. With so many why learn Swedish reasons out there, it’s no wonder that many people want to know what the true benefits are of learning a brand new language. For one, you are going to have a skill that you will be able to use anywhere and everywhere you go. If you travel a lot, learning and understanding the Swedish language is going to come in handy and will benefit you in many different ways. For this reason, many people are choosing to begin learning Swedish by using books, programs or courses specifically developed to helping people learn well and quickly. For those who want to know why to learn Swedish, there are tons of different things that you can do in your everyday life that specifically help you to begin understanding the language. For one, you can listen to Swedish music and watch movies in this language. You may also want to visit Swedish sites or talk to others who speak Swedish so that you can begin to understand the language. Reading and speaking are both fundamental in becoming fluent in Swedish, as you will need both skills to truly be able to communicate with the world around you if you make the decision to travel abroad. There are a ton of programs, courses and classes that you can benefit from that specifically teach Swedish. Swedish is one of those languages that is spoken by millions, so being able to easily and quickly get this down is easier than you might think. The key to finding a good program is to find out what each of them teaches and how quickly you are going to be able to pick up on the Swedish that is being spoken and read. You will find an enormous difference in how you are able to function with this language in the way that you learn it on your own. Many people are able to teach themselves Swedish while others may need to take a local class or course that is given by a teacher. The other key to becoming fluent in Swedish is to practice often. If you are able to speak in Swedish or write and read in Swedish, this is what you’re going to want to do. The more that you immerse yourself in the language, the more likely it is going to be that you actually learn the language and begin to understand it in a way that is beneficial to you. There are a lot of different people right now who are trying to learn Swedish but do not do anything more than a program. You need to immerse yourself in the language fully to become good at speaking, reading and writing. How Quickly Can You Learn? How quickly you learn depends on how much you are able to devote to learning a brand new language, whether or not you already speak other languages and the program that you are using. If you use a simple program that doesn’t teach much and you’re not entirely committed to learning a brand new language, you are going to find that you don’t understand Swedish the same way someone who truly studied will be able to accomplish. This is why you need to find a good program and immerse yourself in the program. It can take weeks, months or even years to become truly fluent in Swedish where you are able to hold a full conversation with someone who speaks Swedish themselves. Is it Easy to Learn Swedish? Again, how easy it is to learn Swedish depends on the person. If you are able to pick up new languages quickly and easily, you will probably find that you have no issues with learning a brand new language. This is why you need a program that offers you the education that you need in a way that is going to work well for you. You will love being able to easily and quickly learn a brand new language without it being a problem thanks to the many programs that are available to you. The reason a lot of people choose Swedish over some of the other languages that are out there is because they are able to speak with millions of people worldwide. Swedish is spoken in a multitude of other countries, making it one of the most sought-after languages. Because of this, you can feel good knowing that you are learning a brand new language that is going to provide you with the education that you need while also learning something that is going to add a skill to your life that will take you through many different scenarios. Be sure to use a good Swedish program and you will find that it is easier and quicker than ever for you to learn the language.